Donald Trump at the Trump International Golf Links outside Aberdeen, Scotland. Scotland is teed off with Donald Trump. A Scottish politician called for a boycott of Trump's two golf courses in the country on Wednesday. The billionaire presidential candidate has suffered a backlash since calling for a temporary ban on Muslims entering the United States. "This bigoted blowhard of a man is being rightly condemned far and wide, and I'm confident that Scotland will reject his extremist rhetoric," said Patrick Harvie, a Green member of the Scottish parliament. Harvie's motion, filed with the Scottish parliament, "urges Scots and visitors to Scotland to consider boycotting the Scottish hotels and golf courses that Trump owns." Trump fired back in an editorial published in a Scottish newspaper Friday. Trump wrote that U.K. politicians "should be thanking me instead of pandering to political correctness." He said he was investing $250 million in one of his golf resort, "which will totally revitalize that vast region of Scotland." Trump International Golf Links stands along the North Sea dunes, outside Aberdeen. It will host the Scottish Open in 2017, 2019 and 2020. It opened in 2012 after planning battles with locals and environmentalists. 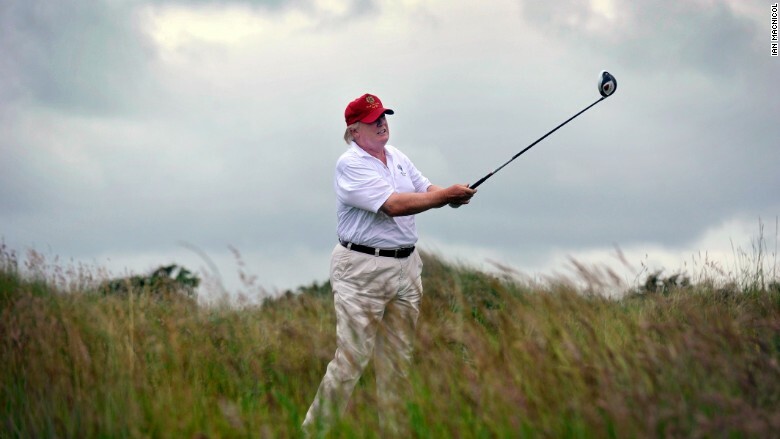 Trump then fought government plans for an off-shore wind farm, saying it would blight the view from the course. He lost and is appealing the ruling to the U.K. Supreme Court. For that, Scots had called for Trump to be removed as a "Globascot," which is a list of nearly 900 business people who help promote Scotland. Trump was invited by the Scottish government in 2006 to join the largely symbolic group. He was removed Wednesday by the current government over his comments about Muslims. In 2012, Trump called for his own Scottish boycott, of Glenfiddich whisky. It hosted an event that honored an Aberdeen land owner who had aggressively fought Trump's golf course. He also vowed not to stock any whisky by Glenfiddich owner William Grant & Sons. Trump also owns Turnberry, one of Scotland's most famous courses. It occasionally hosts Britain's most prestigious event, The Open Championship. Turnberry last hosted the rotating event in 2009. On Wednesday, Robert Gordon University in Aberdeen stripped Trump of an honorary degree he received in 2010. Meanwhile, a petition to block Trump from entering the U.K. has received over 400,000 signatures.